I would have a hard time trying to find the exact source of this anonymous text, but the writing style points to the early Victorian times. No doubt, the author was one of the American tourists appreciating France’s unabashed joie-de-vivre and the lack of remorse for having good time – a remorse which was so ingrained in the Anglo-Saxon soul. One of the most striking contrasts between the French and Americans is in their physical appearance. Both sexes of the former look healthy and robust. Their countenances are full and florid, and have an expression of sensual ease and contentment, as if they were on good terms with themselves and the world. They have none of the care-worn, haggard American physiognomy, which gives youth the air of age, and betokens a race in which labor and thought are paramount to all other considerations. On the contrary, the French when old, look young. The pleasures of this life oil the joints of age, so that time slips smoothly by. If any class belie their years it is the children, to whom overdress and physical restraint give an expression of premature gravity or unnatural heaviness. No doubt the outdoor, and “care not for to-morrow,” life of the French, combined with their passion for amusements, has much to do in their fine state of preservation. Something must be put down to their superior toilets. For the English, with perhaps a higher condition of health, look beside them, to use a comprehensive term in the female vocabulary, like frights, or in other words, there is about as much difference of exterior between the two races as between a buffalo and a blood horse. This applies more particularly to the women. I verily believe an English lady to be incorrigible in matters of taste; or else it has become a point of honor with her to make herself as unattractive as possible. If both nations would divide equally their respective pride and vanity, the result would be a decided improvement in each. Add to this composition the go-ahead principle of brother Jonathan, and the world would have a specimen of a race that would soon distance all national competition in the essential points of order, beauty, and energy. For a man whose passions are his slaves, whose sentiments are obedient to his will, whose emotions are made so many sources of epicurean pleasure, who lives only to extract the greatest amount of happiness from the sensual world, regardless of a spiritual life, Paris affords resources which are not to be found elsewhere. It is emphatically the home of the man of the world. All that the head can covet is at his option ; but if he has the faintest suspicion of possessing a heart in which dwells the love of the true and natural, he had better withdraw it from the vortex of Parisian life, before it is sucked in too deep to escape. For the sympathies of the heart I have found the French females most keenly alive, no mothers can be more devotedly attached to their children than they are, and it is repaid to them with interest by their offspring, as a devotional affection towards parents is carried to an extreme; in some instances I should say to a fault, as a daughter in general looks up entirely to them, in regard to the man that they may choose with whom she is to pass the rest of her life, without presuming that she ought to make a selection for herself, considering that her marriage is the affair of her parents, and that she has but to obey their wishes in that, as well as in all other cases; hence it is rarely found that a French young lady has thought of romance in her composition, but is on the contrary the mild, docile, obedient, and affectionate pupil, and often imitator of her mother. The English young lady is a little more rebellious; possessing a more independent spirit, she very soon takes the liberty of thinking for herself, particularly on that subject; and could she totally have her will would act for herself also. 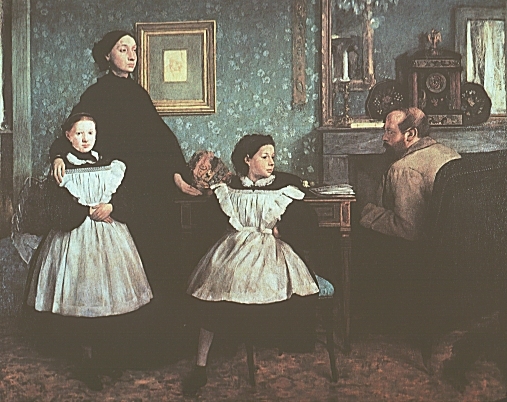 Families are much more united in France than in England, and agree together in a most astonishing manner; thus when a daughter marries, instead of quitting her home, the husband arranges his affairs so as to go and live with her parents, and in many cases several families live together and form one little community, which spares the pain of separation of parent and child. The numerous offspring of the celebrated Marquis de Lafayette was a remarkable instance of how whole families can live and agree under the same roof; at his seat called La Grange, his married children and their children and grandchildren were all residing together, whilst he, like one of the ancient patriarchs, was the revered head of his people. I know a case at Boulogne, where in one house there are living together, two great grandfathers, one grandfather and grandmother, two fathers and two mothers and their four children, and what renders it more curious is that they are half English and half French, but all connected by their sons and daughters intermarrying; but strange to say that the English could not agree to live together in that manner, and it is a most extraordinary circumstance much remarked by the French, that wherever the English are settled in any town in France, they always contrive to quarrel with each other, and find employment for the French lawyers; at Boulogne they have at least twice as much practice for the English as for the natives. 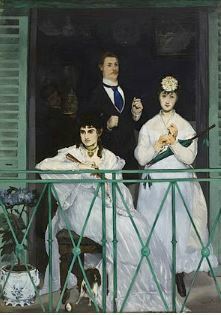 James Tissot (1836 – 1902) was the story-teller of elegant Victorian life. Without a Dowry is one of Tissot’s paintings in a series called La Femme à Paris. 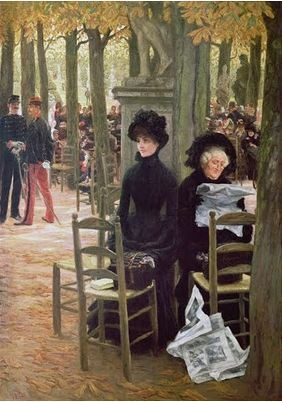 The picture is also known as Sunday in the Luxembourg Garden. The Jardin de Luxembourg was a popular recreational area on the Left Bank protected from the undesirables by a tall forged-iron fence. Here one could rent a chair to enjoy fresh air in comfort. The chair rental is probably the only Sunday pleasure the two women in the painting can afford. Both the mother and the daughter are in mourning – one can guess that the father, probably a poorly-paid government clerk, is gone and they are living on a small pension. Without a sufficient dowry, the young woman has no hope for a happy future. Maybe, just maybe, she will marry a widower with six children or an old man in need of a nurse. Until then, genteel poverty is her fate. The newspapers in this picture story play a significant role: mothers assiduously read marriage offers published by individuals or by agencies. The matrimonial agencies of Paris do a thriving business. They are located in all sections of the city, and are of different classes, according to the wealth and standing of the families of the parties they deal with — young men who are looking for a wife with a good dowry, the money consideration being the main incentive, and parents who have marriageable daughters, being the principal customers. 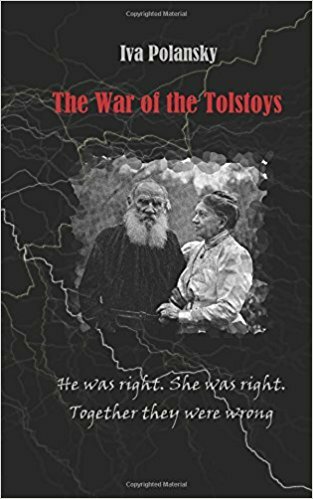 The agents, when they effect a marriage, stipulate that they shall receive five percent of the dowry, and generally manage also to get a good retaining-fee from both parties. The larger establishments are in correspondence with similar agencies on all parts of the continent and have become a necessity to parents who are looking out for eligible wives for their sons and responsible husbands for their daughters. The successful tradesman who has accumulated a fortune desires his daughters to marry in a higher circle than that in which he associates: hence the necessity of an agent to make the necessary advances. Then elaborate papers must be prepared and signed before the marriage is consummated, and unless the dowry is paid down at the stipulated time the engagement is off. To manage all these preliminaries requires practical knowledge and experience which few parties in private life could be expected to possess. The agency of Madame St. Just only does openly what hundreds of others have for ages been doing secretly, and she has at once risen to the head of the profession. She is one of those business geniuses who believe in advertising, and she is, of course, pushing aside all the old fogies who have transacted their business as if secrecy was necessary to all their movements. Madame St. Just says the French law of marriage, and the national custom, render matrimonial agencies a necessity, and in a recent trial the courts have sustained the position she has taken. No one under twenty-five years of age, either son or daughter, can marry without the consent of his or her parents, or, if the parents are dead, without the consent of the grandparents, if any are living. If none of them are living, applicants must substantiate the fact by bringing certificates of their death and burial. Thus it will be seen that parents make all the arrangements for marriage, and, as they do not know who are the eligible parties in the matrimonial market, they must apply to those who make it a business to keep a record, with the pedigree and pecuniary standing or prospects, of all the young men and girls who are similarly eligible. If John Smith should have settled on his daughter a dowry of twenty thousand francs, he has a money interest in securing for her a husband similarly endowed, and he awaits the guarantee of a responsible agent that there is no false pretense being practiced upon him. How would he be able to ascertain that Tom Brown, who applied for the hand of Miss Smith, was all that he represented himself to be, and whether his father was responsible for the twenty thousand francs which he had promised to give his son on the morning of his marriage, or how would he know that there were twenty or thirty young men of good family and good money-standing who are anxious to secure a wife with the twenty-thousand-franc charm possessed by Miss Smith, if there were not an agent to apply to who kept a record of all such young-aspirants for matrimony? Or how would the parents of these young men know that there was such an eligible party as Miss Smith in existence if they had not applied to Madame St. Just for the information? It’s a common remark among strangers in France that about every third man wears a uniform of some kind and such is almost the case here in Paris. Nearly all of these uniformed men are forbidden by law to marry, and they belong to a class who have never been taught to entertain such an idea as pertaining to their future existence. They have always found it difficult to get food for themselves, and hence have never entertained such a preposterous undertaking as marrying and supporting a family. These men have sisters who have always recognized themselves as belonging to a class who are never to know the relations of husband and wife. Such a thought never enters the head of a girl or a boy belonging to the poorer classes of Paris. Sometimes they succeed in drawing themselves out of their natural state of existence, and aspire to higher things, but the great mass of them have for generation found that the chief aim in life was bread and wine. They have the natural passions of ordinary men and women, and hence the grisette. They are not taught, even by their spiritual counsellors, that there is any sin in the life they lead, and are as punctual in their church attendance as any class in Paris. Nor are they regarded as degraded, unless they fall still lower and become professional courtesans. They are considered as fulfilling their destiny, and love and are beloved as other mortals. Sometimes these ties are permanent, but in the generality of cases they are merely for a time, and when broken a new one is formed. Thus they pass through life, and their children, of whom they furnish the state about eighteen thousand per annum, are sometimes kept and maintained by themselves, but oftener passed over to the orphan-asylums, just as most of their mothers were passed over in their early infancy. 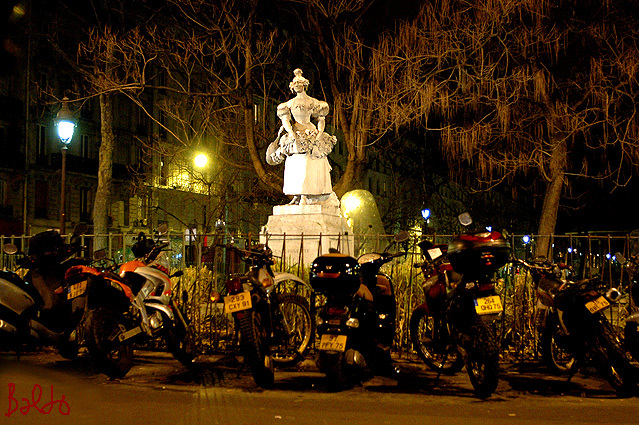 The grisette, it will thus be seen, is a feature of Parisian society that is regarded as inevitable, and, being inevitable, those who raise themselves out of its slough are not deemed to have been tainted or tarnished in character. Those who pass through life as grisettes are not regarded as “fallen angels” but as women who are fulfilling their sad and unfortunate destiny and whose chances for heaven are quite as good as those whose lots are cast in pleasanter ways. So long as the youth lasts they live a merry life, and when this departs, they become waiting-maids. They are the unfortunate victims of kingcraft, which requires standing armies and draws the youth of the country away from the ordinary pursuits of life and happiness.